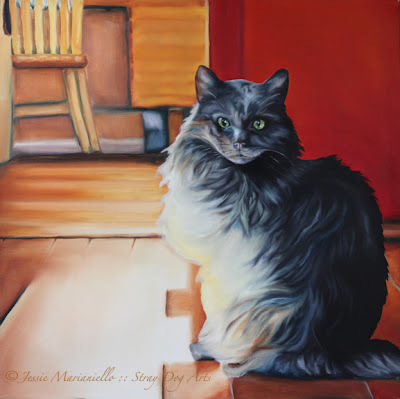 And, because of this, I'm happy to share with you a recently completed portrait of Marly Paul, aka BooBoo, aka one of the most endearing cats I've ever met. BooBoo's portrait has been in the process of coming into being for a very long time. It's not by accident that I ended up finally diving into this painting after returning home from my travels in Morocco, where I photographed stray cats for a series of paintings that I will be working on. Oh, those cats...they broke me open. I went there with the intention of photographing street dogs and so, when my project took an unexpected turn, I wasn't really emotionally prepared for it, you know? Not at all, actually. But the connection between BooBoo and my travels does not end there. His "mama," Julie, also used to live there! What are the chances?! I often feel like I need to just step out of the way and let things happen as they are supposed to. I make a plan and then the details end up unfolding in very different ways. When this happens, it is often challenging for me to deviate from my proposed timelines and plans. But more and more, I am learning to trust. After all, when I finally let go, that's when the good stuff REALLY starts to happen. Things like this portrait. I had just returned home from Morocco a couple of weeks previous, had recently recovered from a travel bug, was finally sinking back into the groove of painting, and there I was painting BooBoo, an ancient cat nearing his second decade of life, and, well...the tears just started to roll! Strangely, it felt good. In the act of creating, something was being processed. While my own cat, Viscosa, slept next to me in the studio, I felt the presence of her, of BooBoo, of every single cat I had come in contact with while in Morocco and beyond. A feeling just sort of flooded through me in the easiest, purest of ways. There was a moment when, as I worked on BooBoos' portrait, great big plump tears rolled and plopped from my eyes. I was surprised! What the...?? The tears were coming from somewhere very clear and neutral. They weren't sad tears, not at all. They weren't happy tears. They weren't any certain kind of tears except the kind that comes from, well...being open. Morocco changed something in me. I photographed hundreds of stray cats. Some of them healthy and some of them on the verge of starvation and probably death. It is a lot for an animal loving heart to take in. The timing for this portrait could not have been more perfect. I gave myself over to it completely and was profusely energized by it in the process. Even the colors infused me in just the right way! When it came time to deliver the portrait, it was a dark, rainy day. I had the canvas wrapped in an immensely soft, wildly bright yellow blanket. Julie's smile, upon answering the door, was sparkly and expectant. It felt good to see her and the dogs. We unveiled the painting in the living room where BooBoo was curled up on the couch--these days he is a skinny, frail old man, although still so full of spirit and life(!) --which is when BOTH Julie and I BURST into tears!! Geez!! I have to tell you that I have never cried like that when delivering a painting! But there we were...both of us crying like big dumb babies and laughing and crying and shaking our heads and just, well...feeling an immense amount of love. LOVE. That is the only way I can describe what this experience is. From beginning to end.